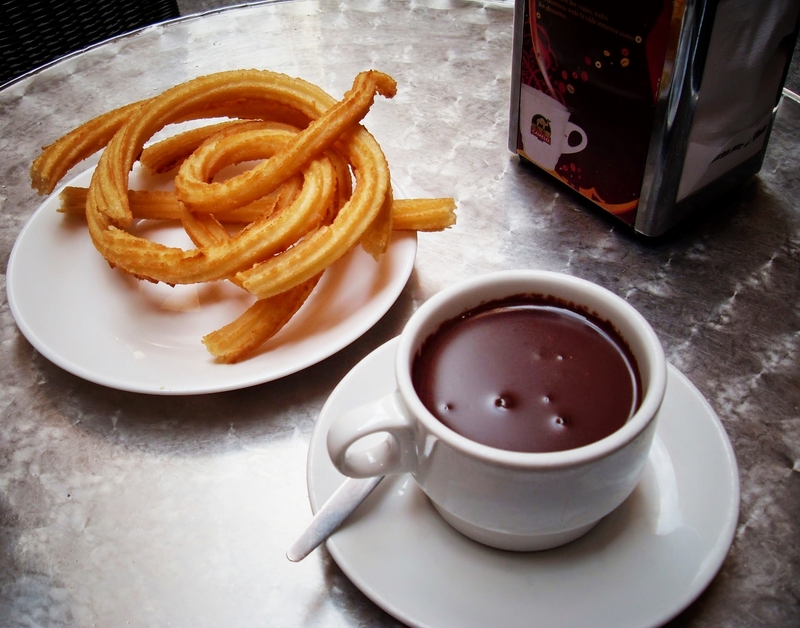 Tucked in a pedestrian passage off of the Puerta del Sol and attached to Iglesia San Ginés, the Chocolatería San Ginés has served chocolate con churros since 1894. This interpretation may not be what many are used to, but the combination is divine. The hot chocolate is similar to a rich, dark pudding; rather than a beverage, it’s used as a dipping sauce for the long pieces of golden fried dough. The churros, an unembellished close relative of Mexican churros, are crisp on the outside and doughy on the inside, allowing the chocolate flavor to shine. Each time I’ve returned to Chocolatería San Ginés, it has lived up to my expectations. One particular visit to stands out though. 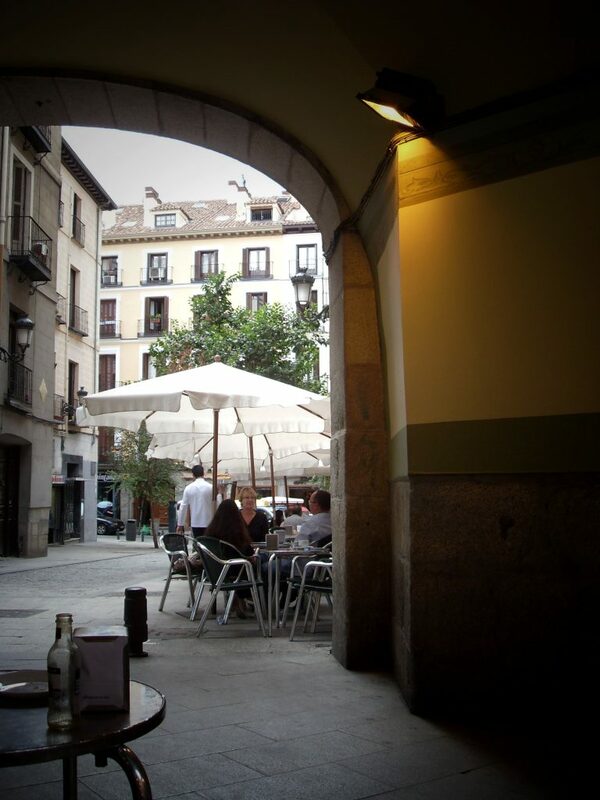 Routed through Madrid on a business trip in January 2012, I was in town for only one evening. 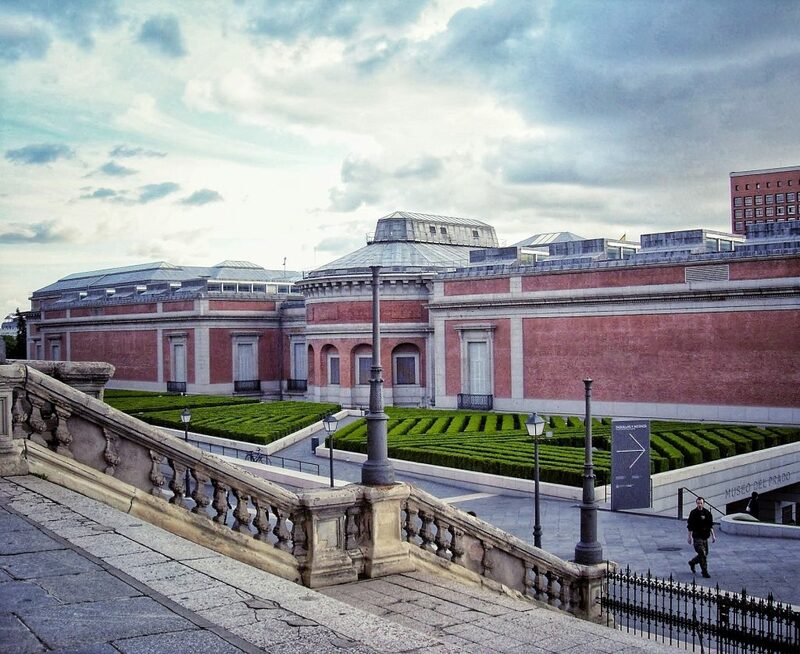 Even though I had to be up early the next morning, rather than order room service and watch television at my airport hotel, I took the short taxi ride into the city to enjoy a few of my favorite things in Madrid: the Museo del Prado, dinner on Plaza Santa Ana, and dessert at Chocolatería San Ginés. When the museum closed, I crossed the street and started up the hill toward Plaza Santa Ana. Though it was already dark, the dinner hour doesn’t commence until 9:00-10:00 p.m. in Madrid so there were plenty of people on their way for an aperitif and tapas. The plaza seemed so different in winter, people only passing through or ducking into restaurants and bars. In warmer weather it teems with life, the many tables full of people, children playing on the playground in the north west corner, and small groups congregating to talk while watching their dogs play and search for scraps. I returned to a restaurant called Miau Miau, which I’d found in 2010 when I stayed nearby. The wait staff seemed to know almost everyone who entered, greeting them with a nod as they hopped onto a stool at the counter to enjoy a drink and a few tapas, or tucked into a table for a private chat. I enjoyed watching their interactions and imagining what a life here could be like, to be part of a neighborhood, to live with time shifted forward. Though I received a few curious glances, I’d long dispensed with the shyness of being a woman eating alone in a foreign country. Careful to save room for my coveted dessert, I enjoyed a plate of grilled vegetables and a small glass of red wine. 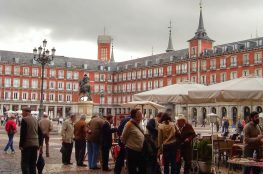 Afterward, I made my way slowly toward the Puerta del Sol, admiring the architecture and enjoying the crisp air. At this point in time, my husband and I were not yet together, and my plan to get to know him better included finding a key chain with a little plaque bearing his family crest, and the etymological history of his last name. However, the souvenir shops I stopped in were all out of his name, which was odd because it’s not too common. Determined, I braced myself against the cold and walked well beyond Puerta del Sol, past the turnoff to Chocolatería San Ginés, checking each shop along the way, feeling a bit deflated. Just before everything closed for the evening, I found one. Victorious, I retraced my steps to claim my prize. Old-fashioned black iron lanterns lined Pasadizo de San Ginés, illuminating the Teatro Joy Eslava, with its gray doors and glittering gold decorative hardware. There weren’t many others sitting outside that cold night, but there were enough people to make me feel comfortable. I warmed up beside the triangular, glowing heat lamp. People filtered through the lane, families, elderly couples with arms linked, and small groups of young people, likely on their way to dinner. I basked in the afterglow of having seen a Caravaggio, imagined what luck the key chain might bring, and felt fortunate to be where I was. Not wanting the night to end, I savored each bite. Finishing the rest of the chocolate with a spoon made me feel like a little girl again. As a child I could never have imagined this experience for myself, enjoying an evening in Madrid by myself. Although I’d been traveling alone in Europe for 13 years, it still felt surreal at times. My morning wake-up call set for 4:00 a.m., I walked to the Puerta del Sol and regretfully hailed a cab. Twisted back in my seat, I stared out the back window to drink in every last bit of Madrid, not knowing when I’d return. Have you visited Chocolatería San Ginés, or do you have another chocolatería to recommend in Madrid? What is your favorite treat while traveling? Pasadizo de San Gines, 5. 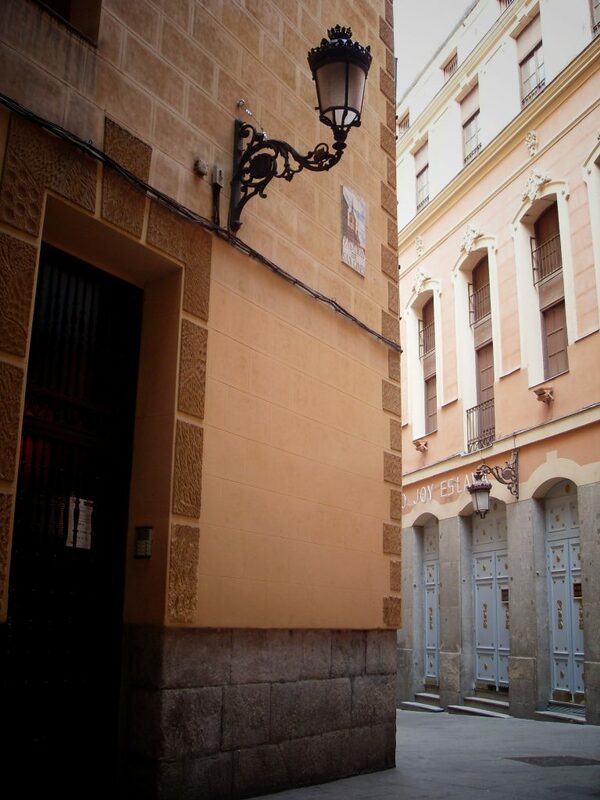 From the Puerta del Sol, stroll west on Calle del Arenal to the corner of Pasadizo de San Ginés, where you will find a charming antiquarian book stall, Librería San Ginés, attached to Iglesia San Ginés. Turn left and walk up the pedestrian passage noting the beautiful 19th century theater on the left, now a famous nightclub and concert venue. 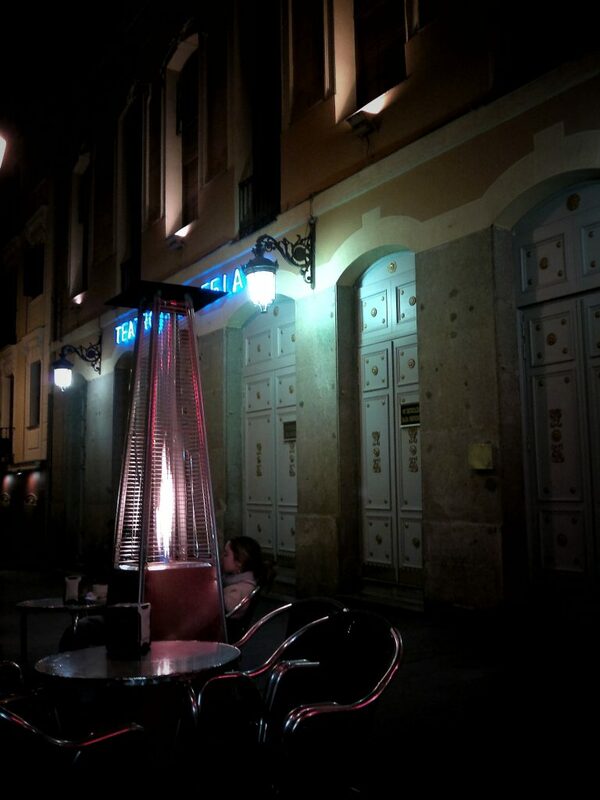 At the top of the incline on the left sits Chocolatería San Ginés, with tables lining either side of the passage. Upon arrival, order at the register just inside the door. They will ask if you wish to sit inside or outside. Decorated in the belle epoque style, the inside is white with dark green accents and marble tables. However, I’ve always preferred to sit outside, either enjoying the cool shaded passageway or staying toasty under a heat lamp, and people watching. After selecting a table, keep your ticket out as proof of payment for the waiter. 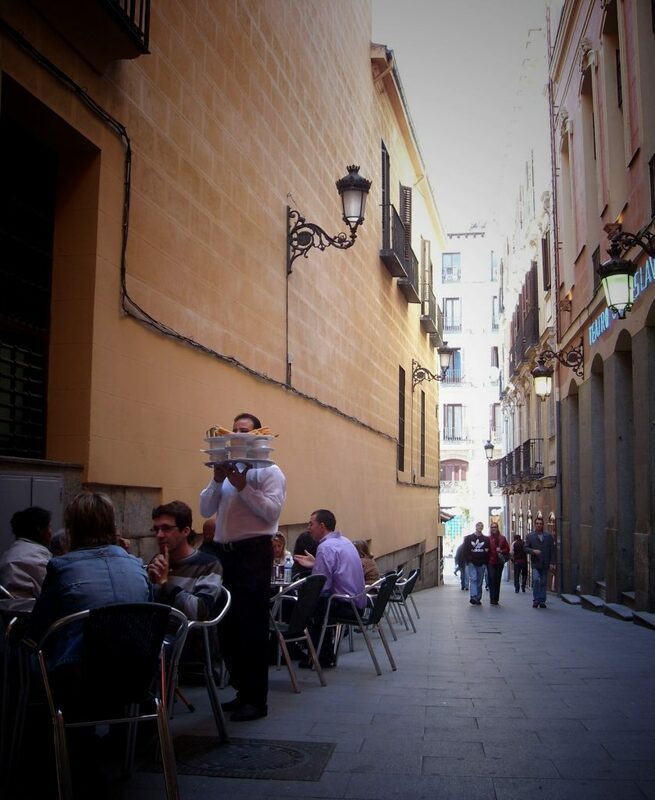 I don’t understand their system; the waiter keeps emerging from the doorway with trays of oversized tea cups stacked three or four high on top of one another, and plates heaped with churros. He seems to know to whom they belong by instinct. The proper way to eat this combination is to pull off a bit of the long, ropy churro and dunk it into the chocolate, much like a doughnut in coffee. Inevitably, there will be chocolate left in the bottom of the cup, impossible to drink due to its thickness, it can be eaten with a spoon. However you eat your chocolate and churros, I’m sure you will enjoy this heavenly duo.